I recently found out about a new tool, Trendsmap, that tracks and visually organizes local Twitter trends. Finally, a service for breaking news reporters to not only find what one’s local digital community is talking about in real time, but who’s talking about it. Trendsmap is still in development, it seems. For now, the page defaults to a Los Angeles “home” region. (This can easily be worked around.) Also, not every region is included in the trends; only major metropolitan areas. Regardless, I’ll be keeping an eye on Trendsmap, and reporters should as well. Through the tool, you’ll be able to find sources and build your readership with key influencers who drive the local news conversation. If you’re looking for the Next Big Thing in blogging and social media, it’s already here in the form of lifestreaming. Thanks to really easy-to-use (and fun) software by Posterous, lifestreaming and storystreaming are going mainstream. Daniel Honigman, on this blog, has posted some great tips and tricks on lifestreaming and storystreaming. Inspired by Daniel’s enthusiasm, I have been noodling over what might be the best uses for this at a mainstream media operation. At statesman.com, we ran our first full storystreaming experiment this past weekend, with great success. We used our popular Weather Watch blog to explain to readers what we wanted. In a nutshell, we wanted their photos and a short description of what they were doing on a hot Sunday. We sent links out through several of our Twitter channels and through the Statesman’s Facebook fan page. When you create a new blog on Posterous, you are given the option to let “anyone” contribute. We checked that box. It gives you an e-mail address that anyone can use to submit a photo, text, audio, video, etc. When something is sent by an outside user, the owners of the lifestream can go in and see the entries and approve them before they appear on the blog. At the Statesman, we had several people tasked on that Sunday with checking the queue for new submissions. We approved most of the 70 submissions we received, only ignoring ones that were off topic. We showed off the submissions prominently online (it was the centerpiece of the statesman.com home page Monday morning) and in print (we chose some of the better pictures and ran them in our daily roundup in our Metro & State section). We put the photos into a gallery on statesman.com, and it was the top page-view driver for our site on Monday with more than 70,000 page views. We also gained some valuable experience using Posterous and proved the concept for future projects. We published the content we received several ways: Posterous, Twitter, in our photo gallery and in print. That type of cross-platform publishing is healthy. The quality of the pictures were really good. Some were funny, some were artistic, and all were thoughtful. Through this project, Central Texans could all feel the pain of a hot summer and share a small slice of their lives. Posterous is a really good platform. Everyone involved in the project on this end said so, and we didn’t get complaints from the public. I wish we had used a Statesman e-mail address (that would forward to Posterous) because “post@austinheat.posterous.com” is a lot to type on an iPhone. We used this mainly as a way to gather user photos. Considering Posterous’ potential, we could have done much more. Besides photos, there’s no reason we couldn’t curate videos, audio, text, tweets, and other content in a future lifestream project. We will look to use it for a richer experience next time. We didn’t syndicate the content out as much as we could have. Posterous allows you to push it out to dozens of platforms. We used a few. Why not a Flickr stream? Despite all the “I wishes”, I thought it was a success. We enjoyed the experiment. I personally have some more ideas for using this in the future, from eventstreaming the Austin City Limits Music Festival and South by Southwest to storystreaming coverage of a sports season. I know some of my colleagues here were inspired by the platform’s potential as well. Has any other mainstream media outlet used these techniques effectively yet? I’d love to hear how it went. Want to really connect with your community? Assuming you’ve been working hard to connect with your readers in a virtual world, it’s time to take it a step further and let people know you in the real world. Join your local Social Media Club chapter. If there isn’t a chapter in your area, get together with a few other social media users in the community and start one. These are great for networking, and you’ll learn all kinds of techniques you can apply to your organization.Attend a tweetup. If you’ve never been to a tweetup, they’re usually an excuse to hang out with others who are interested in social media in your community. Again, great for networking (and having a great time). Volunteer to speak about social media at the local university or at other functions. This is a great way to get your efforts out there, and to hear great feedback. * Host a tweetup. Colonel Tribune has been hosting tweetups for a while now in the Windy City. The attendance is great (often more than 100 people show). The American-Statesman held a tweetup in December, and about 75 people showed. Hosting one is easy. Just call your favorite pub or restaurant and ask them whether they can handle an influx of people on a Thursday or Friday evening. Once that’s nailed down, just send notes out via Twitter (and Facebook, if you’d like) inviting anyone who wants to come. You don’t have to pay for food, drinks or provide a band. All you have to do is organize a little. Colonel Tribune gives out newspaper hats and has given away commemorative Obama papers at his tweetups. The Statesman gave out T-shirts that marketing helped put together. People love these tweetups and will talk about it for a while after they’re over. It’s great to put faces and personalities with the peole you converse with using social media. And people love getting to know the people behind your efforts. It’s a win-win situation, so get out there. What have you done to put a face on your organization? Journalism and social media go together like peas and carrots. (Or, as I prefer, cinnamon ice cream and hot caramel.) You spread social media technologies, philosophies and practices in your newsroom, and as a result, your co-workers may have created Facebook accounts. They may dabble on Twitter. In fact, they may also blog in addition to producing content for print. A storystream helps bring to light, through a chronological narrative, a particular issue, process or concept over a more significant period of time than an eventstream usually covers. Used journalistically, it turns into a collaborative stream of consciousness that tells a story. Good stories have multiple characters, and a storystream should be no different. For your storystream to be successful, it must consist of multiple points of view. Think of your storystream as a collaborative or collective narrative, with multiple authors. Storystreams are new. Storystreams are different. And, most importantly, a storystream can connect a publication to its readers like never before. In addition, you’ll need to set rules. Be very specific on the types of submissions you’ll accept, its guidelines — character count, photo resolution, video length, etc. — and, if applicable, content rights. 2. Recruit contributors: Individuals may be able to carry one part of a story, but if your storystream has multiple authors, there will just be more content your readers can relate to. Think of all those times you asked your readers for user-generated content. It probably seemed a bit disjointed from the rest of your publication’s journalistic activities, or just an afterthought, no? Recruit your readers in the real-time telling of a particular story, and you’ll have more than one person to help you spread the word about your storystream. 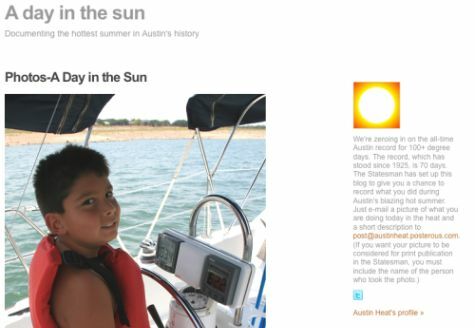 For its recent “A Day in the Sun” storystream, the Austin American-Statesman announced the project on its site, on Twitter and Facebook. Announce your project in multiple media with “you”-centric language. After all, the storystream is about your readers, not you per se. One more note: When you recruit, be sure to refer back to your theme and guidelines regularly. 3. Curate your content: Once your storystream has new contributors, you’ll need someone to oversee the flow of content — and questions — you’ll get from them. Is it the content what you’re looking for? Is it good content? Does it fall within the guidelines you laid out earlier? Curate before you publish and the story will be clearer and better. Tell your friends about your project. Tell co-workers, digerati — both local and non-local — and explain to them what the project actually is. They may be so excited, they’ll want to contribute or spread the word. 5. Reward your contributors: Come up with some incentive for your readers to contribute. Invite your storystreamers in for an exclusive tour of the newsroom. Give them a percentage off their newspaper subscription for a couple of months. Give them a T-shirt. Buy them a beer. Do something. If you follow these steps, your storystream will bring your readers closer to you than ever before. It will also get them excited to be a part of your news brand. As always, if you have any suggestions, please feel free to post them as comments below!